Record 13-1. Lost the second game of the season to Grand Rapids East Kentwood 30-39. Won 12 straight games. Offense averaged – 31.0 points per game, defense gave up 7.3 points per game. Grand Ledge had to defeat the 1st, 2nd, 3rd, and 4th ranked teams in the state to win the championship. They won the district, regional, semi-final and finals by a total of 12 combined points. With less than 4 minutes remaining, Grand Ledge went for 2 points. They recovered the onside kick. Two plays later Grand Ledge scored and took the lead at 19-14. With 1.46 minutes left, Grand Ledge held on to defeat Utica Eisenhower to win the State Championship. 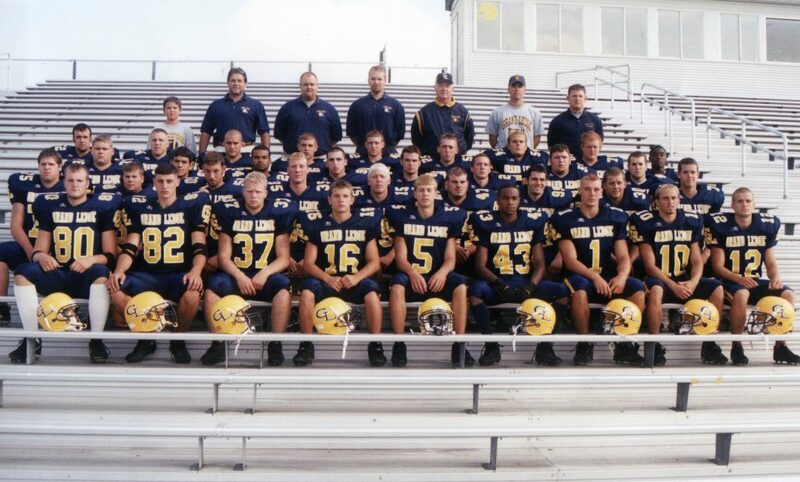 Missing are Nick Sandy, Brandon Caswell, Chris Gentry, Ken Bohnet, Ben Coleman, Dan Barnes, Drew Mooney.